DIFFERENT FROM REGULAR JEWELRY CLEANERS? 2. 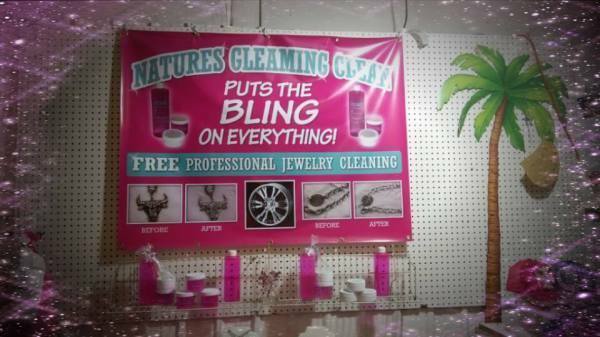 WHAT TYPE OF JEWELRY CAN BE CLEANED WITH NATURE'S GLEAMING CLEAN? All types: Platinum, Gold, Gold-plated, Silver, Silver-plated, Diamonds, Gemstones, soft stones (Opals, Pearls, Jade, Turqoise,etc. ), Antique, Costume (Fake), and Watchbands! 3. 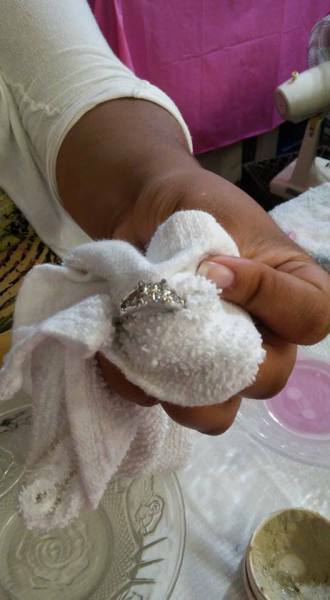 WHY CAN'T MY JEWELER CLEAN MY SOFT STONES? Most jewelers still use regular jewelry cleaner in their cleaning machines and the chemicals are harmful to soft stones! 4. HOW OFTEN CAN THE PRODUCTS BE USED? Jewelry that is worn daily should be cleaned with the liquid cleaner once or twice a week. The polishing cream / tarnish remover should be used monthly or every other month. NATURE'S GLEAMING CLEAN is mild enough to be used daily!! 5. CAN THE TARNISH REMOVER WEAR DOWN MY METAL? Absolutely not! Our polishing cream / tarnish remover is completely non-abrasive and can not scratch or wear down any metal surface! It's excellent for polishing coins and antique jewelry! For gold-plated jewelry apply the cream to a soft cloth and wipe the jewelry with the cloth as opposed to applying the cream directly to the gold-plating! 6. HOW LONG CAN I LEAVE MY JEWELRY IN THE CLEANER? Generally 10 - 15 minutes is all that's needed. However your jewelry can safely soak for several hours. Special care has to be taken when cleaning soft porous stones (opal, pearls, etc. ), painted jewelry, fake jewelry and jewelry with glued-in stones. For these items just dip , gently brush and rinse as opposed to letting them soak! 7. HOW MANY USES CAN I GET OUT OF MY CLEANER? Unlike regular jewelry cleaners, NATURE'S GLEAMING CLEAN does not weaken or lose cleaning strength after it has been used. You can get numerous cleanings from the cleaner. The jewelry cleaner can be strained through a couple of coffee filters to remove dirt and reused! A Gift Pack will last a year or longer depending on how many people are using it and how often! 8. DO THE PRODUCTS CLEAN ANYTHING OTHER THAN JEWELRY? Of course!! It cleans silverware, silver or gold coins, copper pots, chrome & aluminum car rims, chrome faucets, brass statues and eyeglass frames & lenses, crystal and GRILLZ too! FIRST, use the Tarnish Remover/Polishing Cream ! Gently brush til the cream turns gray. Wipe off with a soft dry cloth, the more you wipe the shinier the metal becomes! Use monthly or as often as you like. NEXT use the Liquid Jewelry Cleaner ! Dip jewelry and a soft toothbrush in the jewelry cleaner. and in between prongs and crevices. Jewelry can soak 10 minutes to several hours. and fake jewelry should be dipped and not soaked. Use weekly, it's mild enough for daily use!